simply click on the palette icon to automatically move it to a tray. click and drag on the icon to the tray of your choice. The palette arrangement in the trays can be stored as part of the default interface arrangement by pressing Shift+Ctrl+i or pressing Preferences>Config>Store Config. The Preferences>Interface>Palettes>Auto Collapse option controls how palettes open and close in the Trays. With the option on, if space is needed to accommodate an open palette then other palettes will be closed. By default only one palette can be expanded in the Left Tray. If the Preferences>Interface>Palettes>Left Tray option is turned off then more than one palette can be expanded at a time. The same applies to the Right Tray option, though this is off by default. These settings operate in conjuction with the Auto Collapse setting. Some palettes are divided into separate menus called sub-palettes. To open a sub-palette, click on its name. By default, only one sub-palette is open at a time; to open more than one sub-palette, Shift+click the sub-palette name. You can change this default setting if you wish by turning off Preferences>Interface>Palettes>Open One Subpalette. Some of the larger sub-palettes are divided into sections (sometimes called UI Groups). To open a section, click on its name. By default, only one ection is open at a time; to open more than one section, Shift+click the section name. You can change this default setting if you wish by turning off Preferences>Interface>UI Groups>AutoClose UI Groups. 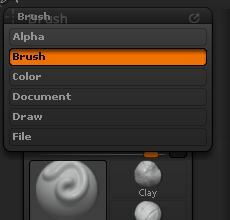 ZBrush does not store preferences automatically. If you alter settings in the Preferences palette then make sure to store the changes by pressing Shift+Ctrl+i or pressing Preferences>Config>Store Config. An alternative operation is provided for sub-palettes by turning on the Preferences>Interface>Subpalette Popup option. With this option turned on, only one sub-palette is shown at a time. Clicking the sub-palette name will show a list of all the sub-palettes in alphabetical order, so that another sub-palette can be chosen. A similar option is available for palettes when they are docked in the left or right trays. With the Preferences>Interface>Palette Popup option turned on, only one palette will show in a tray. Clicking the palette name will show a list of palettes in alphabetical order, so that another palette can be chosen. Note: only those palettes that have be dragged to the tray will show. Palette popup option turned on. In the image above, the Alpha, Brush, Color, Document, Draw and File palettes have been docked in the left tray and the Brush palette is currently showing. If you turn on either of these otptions remember to store the configuration by pressing Shift+Ctrl+i or pressing Preferences>Config>Store Config. 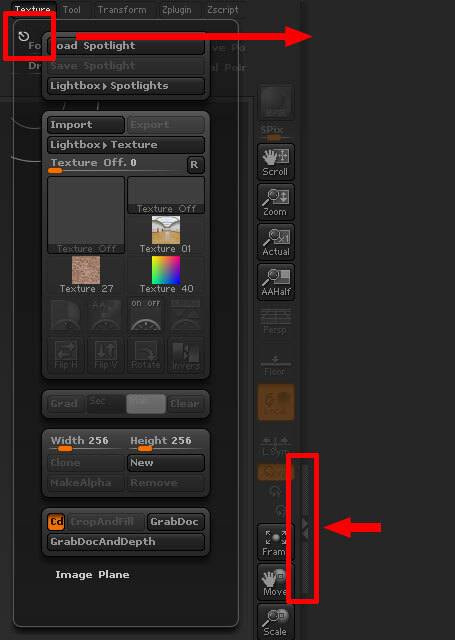 When turning off the options it may be necessary to restart ZBrush before the change takes effect.